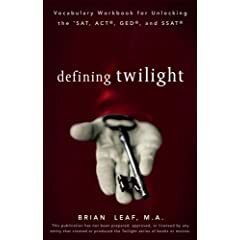 You are here: Home / New Moon / Twilight Vocabulary Workbook: Twilight is Educational? Twilight Vocabulary Workbook: Twilight is Educational? Pre-order from Amazon. Pre-order from Borders. The vocabulary words in Defining New Moon will have very little overlap with the vocabulary words in Defining Twilight. 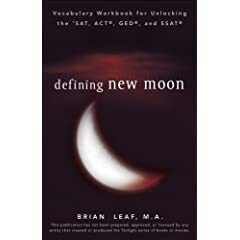 More than 300 of the 320 primary vocabulary words will be new to Defining New Moon. The first page of each chapter lists 8 vocabulary words with page references to Stephenie Meyer’s New Moon. Students refer to New Moon, read each word in context, and attempt to define it. The second page of each chapter provides the actual definitions along with useful synonyms, Latin word parts, and memorization tools. The third page presents SAT, ACT, GED, and SSAT drills to memorize and integrate the definitions of the new words. The fourth page gives clearly delineated solutions to the drills. Every 5 chapters there is a quiz to review and integrate material. Every 20 chapters there is a review of all of the New Moon vocabulry words in the previous 20 chapters. Quiz solutions and a Glossary of all of the book’s voabulary words, including synonyms, are at the back of the book. I’ll be anxious to hear what these are like once some of you get a chance to use them! Are these books available in barnes and noble?